Happy birthday March babies! Your official birthstone is not only beautiful, it’s full of history and mythology. Here are some interesting facts about your birthstone, the aquamarine. In addition to being the birthstone for March and the Zodiac sign of Pisces, aquamarine is also the gemstone used to celebrate a 19th wedding anniversary. The aquamarine is a transparent pale blue variety of beryl (beryllium aluminum silicate) — the same mineral family that emeralds belong to. Like many beryls, aquamarine forms large crystals suitable for sizable fashioned gems and carvings. The word aquamarine is derived from the Latin phrase “aqua marinus,” meaning “water of the sea” because they are said to resemble the beautiful blue green of ocean water. Aquamarines were once said to calm waves and keep sailors safe at sea. March’s birthstone was also thought to enhance the happiness of marriages. Aquamarines come in a wide range of shades and colors, from pale sky blue to richer blue, and blue-green. The rarest and most valuable aquamarines are those with a deep blue color. The best gems combine high clarity with limpid transparency and blue to slightly greenish blue hues. 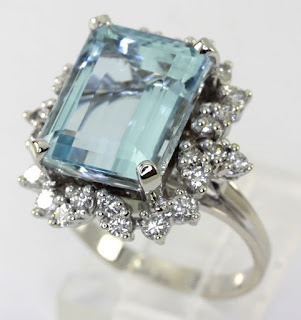 The color of aquamarine is due to trace amounts of iron that works its way inside the crystal. Most commercially sold aquamarines are heat treated to produce a more desirable blue-green color. Aquamarines have a hexagonal-shaped crystal system. They are pleochroic in nature, meaning they can show three colors, depending on the angle they’re viewed. Like many gems, aquamarines are said to have metaphysical powers, including the ability to clear and cleanse, refresh and uplift the mind. They are also said to promote courage, calm, compassion, tolerance, love, communication, self expression, reasoning, intellect, and connection to one’s higher self. Aquamarines are also said to aid in the healing of sore throats, swollen glands, calming nerves, improving vision, and cooling sunburns and fevers. The ancient Romans believed that Neptune, the god of the sea, obtained aquamarines from the jewelry boxes of the Sirens. Legend has it that Neptune gave aquamarines as a gift to the mermaids. goddesses, including Aphrodite, also known as the Greek goddess of love. Aquamarines are also said to bring safety to sailors, who are known to wear aquamarine talismans engraved with the likeness of Neptune, as protection against dangers at sea. Aquamarines are mined in exotic locations including Nigeria, Madagascar, Zambia, Pakistan and Mozambique, but most modern aquamarines come from Brazil. One of the largest aquamarines ever mined weighed 110.5 kg (243 lbs). It was found in 1910 in Marambaia, Minas Gerais, Brazil. In the United States, the only location where you can mine for aquamarines is Mount Antero in the Rocky Mountains of Colorado. The elusive gem is said to be found at altitudes of 14,000 feet or more!